I could not hold it any longer but I wanted you all to know I was asked to be GUEST DESIGNER for PINK AND MAIN!!!! They have the most adorable stamp sets! I was asked to play with two sets of stamps this month..
First one being Sunkissed Greetings! Here is the card I made using the stamp set! 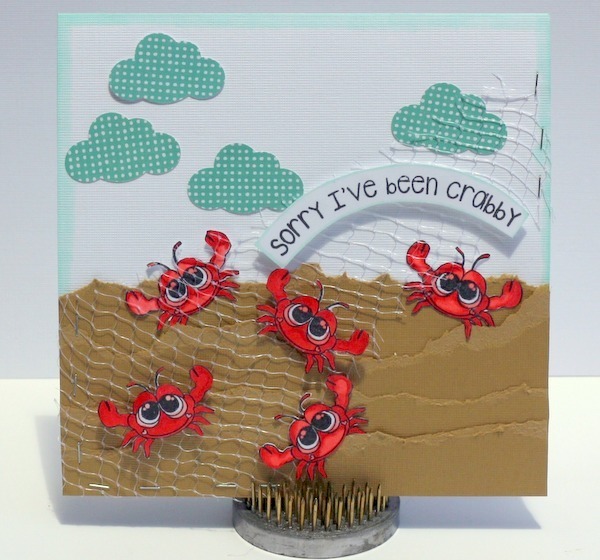 Love those cute little crabs. I wanted this to have a beach effect at the bottom of the card so I used some tan cardstock and did a tearing affect on it and then layered it on the card. I also had some pieces of netting that I knew I wanted to use as (whats crabs without netting right?) so after coloring these with my copic markers I fussy cut all five of them out! Cute Right? then I remembered I had that cloud punch and it went perfect with the card look I was going for. As for the title It was too stinking cute as we all know we can relate at times..
To get this cute stamp set you can go HERE! Also you can take a peek at my blog post on PINK AND MAIN! Congrats!! Your card is adorable!!! Congrats!! Super cute & fun card!! !